ImTOO MP4 Video Converter supports converting multiform videos including AVI, MPEG, WMV, FLV, MKV, MOV, 3GP, RM, etc. to MP4 and AVI with H.265/HEVC supported. ImTOO MP4 Video Converter is a professional MP4 converter software which helps you convert MP4 video from all mainstream video formats such as convert AVI to MP4, MP4 to AVI. It supports iPod, iPhone, PSP, H.264/MPEG-4 AVC codec. It can also convert MP4 to MP3, M4A, and AAC as an audio converter further. The video to MP4 converter can be realized as video to audio & audio converter software, e.g. convert audios like WMA, WAV, CDA, M4A, AAC, AC3 to MP3, M4A, AAC, and extract audio from videos. The converted videos can be played on many MP4 video players like iPod, iPhone, Apple TV, PSP, PS3, Archos, Creative Zen and iRiver. It is your best PSP and iPod MP4 video converter. Supporting a wide range of video formats like AVI, MPEG, WMV, FLV, MKV, MOV, 3GP, H.264/AVC, H.265/HEVC etc., this software provides the quickest way to convert them to MP4 and AVI video with high quality. As an audio converter, ImTOO MP4 Video Converter supports converting WMA, WAV, M4A, AAC, OGG, MP2, CDA, etc. to MP3, M4A and AAC audio, and extracting audio from video file. Capable of detecting multi-core CPU automatically and processing task with multithreading and batch conversion, this program provides you with the fastest speed to convert MP4 video. Introduce NVIDIA CUDA & AMD APP technology to gain the best performance in MP4 video conversion. Adjustable aspect ratio (4:3 and 16:9), resizable player, power management and CD decoding are available. The profile settings are sorted by different types. Converting MP4 video with multi-core CPU will get the highest speed. To save CPU resource, you can customize the core number to process the conversion. The profiles are classified and optimized by device, so you can quickly find the right format you want. Also you can change the parameters of any profile to create a new profile. Add multiple profiles to one source for simultaneous output so as to get multiple files with the same content at one time. Define the start time and duration of a video segment to get your favorite part for converting. If the file is too large for you, you can split it into several ones by choosing the offered split size or customizing split size or time. The built-in Bitrate Calculator helps you get the output file size you want. Simply type the values of file size and video bit rate will be calculated at the same time. A lot of parameters can be adjusted: video size, bit rate, frame rate, audio codec, sample rate, etc. The MP4 video conversion can be finished in the background for less CPU occupation. Choose an after done action before converting MP4 video, then the MP4 converter will automatically exit, shut down, hibernate or stand by as you wish when conversion is over. 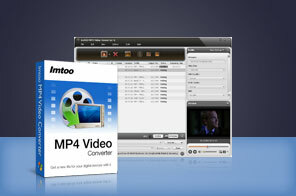 Imtoo MP4 Video Converter provides English, German, Japanese and Chinese language for different mother-tongue users, and several skins for meeting different tastes. Tutorial : ImTOO MP4 Video Converter Guide - How to convert almost all video files to MP4 video format? Convert DVD to MP4 video for your iPod, iPhone, PSP, etc. MP4 players. Convert videos such as AVI, MPEG, WMV, DivX to iPhone video and movie files. How to transfer contacts from iPhone to iPhone ? How to put movies, films on iPhone ? iPhone Manager: How to manage iPhone music, video, movie, photo without iTunes?